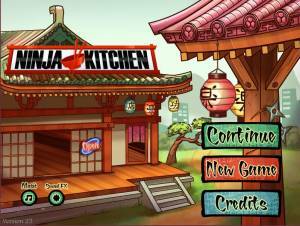 Ninja Kitchen 2011 Play it Now ! Speed is important, but in this kitchen, safety comes first. Put your ninja skills to the test in this game. If customers don't receive their food promptly, they storm out. Each level brings new challenges, but never fear: you're joined by washman Hayato, fellow student of your sensei, and the laconic Kenzo, a chopping madman when he sees a head of lettuce. Despite your dedication and skill, access to the final levels eludes you. Should you spend your accumulated tips to open the Trunk of the Master Ninja, and learn its secret?